In democracies, citizens have a right to know why, where and how the government spends public money. Each year we, therefore, await the Prime Minister’s response to the President’s address in the Budget session of Parliament. This year, Prime Minister Narendra Modi’s speech was less about the financial implications of the intended policies of his government, and more about blaming the Congress for the disasters that track Indians since 1947. In the process, he neatly sidestepped the basic obligation he owes us: accountability. Equally troubling is his rather rash allegation that the Congress was responsible for the partition of the country, and for the division of Jammu and Kashmir. We know that representations of history tend to wander far away from actual events, and even construct them. But Mr. Modi’s explanation of the Partition has little to do with one of the most catastrophic divisions of territory and people in the subcontinent. It has more to do with a personal obsession. 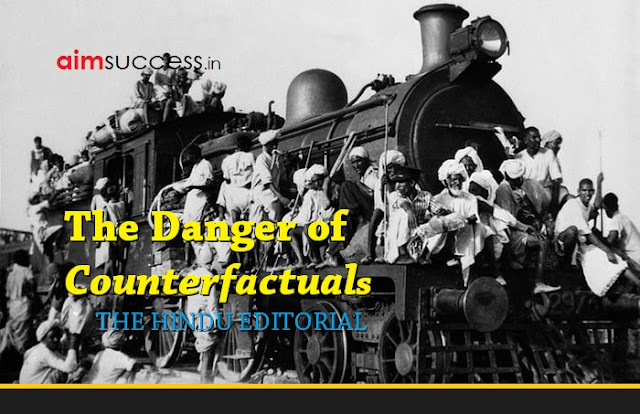 The claim that if Sardar Patel had been the head of the government, Kashmir would have remained united belongs to what is called counterfactual history. In a somewhat random comment, the famous French mathematician Blaise Pascal (1623-1662) wondered whether the history of the world would have been different if Cleopatra’s nose had been shorter. Interestingly, the observation inspired René Goscinny and Albert Uderzo, authors of the delightful comic book series Astérix. Throughout the story of a group of gutsy Gauls fighting the Romans, Getafix the venerable druid, extols Cleopatra and her perfect nose and yearns to rub noses with her. We envy Cleopatra her nose, but we simply do not know whether a shorter version would have given us a different history. We can only speculate. But speculation is hardly history, an endeavour that is deeply contested. The Partition, which led to one of the biggest mass migrations in world history, and to the death of an estimated one million people or more on both sides of the border, is one of the most debated issues among historians. The puzzle can hardly be under-estimated. Till the middle of the 1940s, Partition was just one of the political alternatives before the country. Historians tell us that Jinnah preferred a federation because the Muslim population was spread across India, and Nehru wanted a centralised and unified state. How did these differences spill over into the calamity of the Great Partition? The complex answers historians give to the question, ‘why Partition’, are based on meticulous research of documentary, literary and biographical sources. Most scholars agree that the causes can be traced to the turn of the 19th century. The colonial project, intent on intellectually colonising Indians, proceeded to shape a loose, plural and de-centred tradition known as Hinduism, cast it in the mould of Semitic religions, and create a ‘unified’ faith. A homogeneous version of Hinduism, and later Islam, politicised religious identities and harnessed them to competitive nation-making projects. Colonial policies gave an added fillip to this politicisation through group representation. By the early 20th century, the politicisation of religious identities led to communal violence. Another group of historians focusses on the role of elites in the making of independent nation states. Elites proceeded to tap religious identities, forge a constituency, and mobilise struggles for independence and for a separate state. In recent times, attention has shifted from the causes of the Partition to its consequences: murder, rapes, mutilation, displacement, and generalised suffering. People were mercilessly removed from their homes and hearths in a land that had suddenly become another country. And yet another strain of writing on Partition focalises the making of new nation states through the creation of boundaries, passports, recovery of abducted women, and consolidation of territory. We can hardly discern one reason for the Partition. To ascribe the tragic event to the machinations of the Congress party distorts the multiple, complex and often contradictory developments that led to the separation of Pakistan from India. More significantly, the Prime Minister ignores the role of his own constitutive community, and its ideology of Hindutva, in the making of the Partition. History has taught us a bitter lesson. If a political movement is successful in tapping deep structures of sentiment in a society, these sentiments must already be there, lurking under the skin of a shallow modernity expected to usher in a secular age. After all, religion cannot be harnessed to the cause of communal mobilisation until it has some grip on people’s minds and psyches. Yet, this neat formulation — customised prejudice translates into murderous assaults on the ‘other’ community — gives us cause for unease. People may or may not be inclined towards religiosity, and yet might hesitate to dine or socialise with members of another community. But this does not mean that they ritually inflict harm on the bodies of other people. We can believe that others have their own reasons for thinking and doing what they think and do, and we have different reasons for thinking and doing what we wish to do. For many reasons, people construct symbolic and spatial barriers between themselves and others. Note, however, that the bracketing-off of identities is a social phenomenon. Despite these social barriers, forms of cooperation can and do arise in the workplace, in social and political organisations, in and through movements, and through associational life. When these identities are transformed into political weapons in pursuit of symbolic or material gains, a sociological phenomenon translates into a political movement that lays exclusive claims upon the body politic. The politicisation of identities leads to open and ruthless competition for all sorts of power, invariably at the cost of human lives. What is important is that the transition from, often, hidden animosities to violence involves a trigger. The trigger is provided by organisations that belong to the religious right and/or entrepreneurs and merchants of hate who excel in excavating unarticulated sentiments of resentment against other communities, and in playing up incidents that otherwise can be easily passed off as minor. The trigger stokes and evokes hellfires of hatred, devastating violence, and eternal damnation. When politicised religious identities compete for the same spatial and material resources, communities are motivated to inscribe in-erasable injuries on others, and on the polity. The Partition teaches us that the eruption of insane political violence under the banner of ‘this’ or ‘that’ religion, the suspension of civil ties between erstwhile neighbours, and the merciless brutality inflicted upon the bodies of children, men and women leaves ineradicable scars on collective memories, and destroys civilisations. We should have learnt that religious identities, once evoked, cannot be controlled. The history of religious strife in the subcontinent establishes that the trajectories of identity politics are unexpected, and that they take unforeseen and shocking routes. These routes inevitably lead to devastation. “Each new morn,” says Macduff of war in Shakespeare’s Macbeth, “New widows howl, new orphans cry, new sorrows Strike heaven in the face, that it resounds.” Yet, till today, communal organisations continue to trigger the brutalisation of social and political identities, creation of divides, exacerbation of hitherto muted schisms, and the creation of new ones. We have, it appears, not paid heed to these warnings. If we had, India would not re-enact the horrors of the Partition. Meaning: The fact or condition of being accountable; responsibility. Meaning: Move slowly away from a fixed point or place. Meaning: Extremely unfortunate or unsuccessful. Meaning: Having or showing courage, determination, and spirit. Meaning: A priest, magician, or soothsayer in the ancient Celtic religion. Meaning: Form a theory or conjecture about a subject without firm evidence. Meaning: If an activity or situation spills over, it begins to affect another situation or group of people, especially in an unpleasant or unwanted way. Example: I try not to let my work spill over into my life outside the office. Meaning: A serious accident or bad event causing damage or suffering. Example: A series of calamities ruined them – floods, a failed harvest, and the death of a son. Meaning: Relating to or characteristic of a colony or colonies. Meaning: Control and make use of (natural resources), especially to produce energy. Meaning: Something which acts as a stimulus or boost to an activity. Meaning: To hit something gently, and often repeatedly, especially making short, sharp noises. Example: The branches tapped against the window. Meaning: Create (something) strong, enduring, or successful. Meaning: A home, especially when seen as a place of comfort and love. Example: They were reluctant to leave hearth and home. Meaning: Focus (something), in particular. Meaning: Distinguish (someone or something) with difficulty by sight or with the other senses. Meaning: Regard something as being due to (a cause). Meaning: Give a misleading or false account or impression of. Meaning: Be or remain hidden so as to wait in ambush for someone or something. Meaning: To show someone where they should go, or to make someone go where you want them to go. Example: She ushered us into her office and offered us coffee. Meaning: Mentally prepare (someone) for a testing task or occasion. Meaning: Capable of or intending to murder; dangerously violent. Meaning: Strong religious feeling or belief. Meaning: To eat the main meal of the day, usually in the evening. Example: I hate dining alone. Meaning: Be exceptionally good at or proficient in an activity or subject. Meaning: Not mentioned or coherently expressed. Meaning: Condemnation to eternal punishment in hell. Meaning: To make something that is already bad even worse. Example: This attack will exacerbate the already tense relations between the two communities. Meaning: A split or division between strongly opposed sections or parties, caused by differences in opinion or belief.